Bulls maintaining 4000…. very hardly not giving up to the bears to close below 4000…..
Long the market until 4000 remains uncracked…. Once we closed below 4000. It means that Bears are in Control….. Try to exit your profits as soon as u seen some nice profit in upwards. 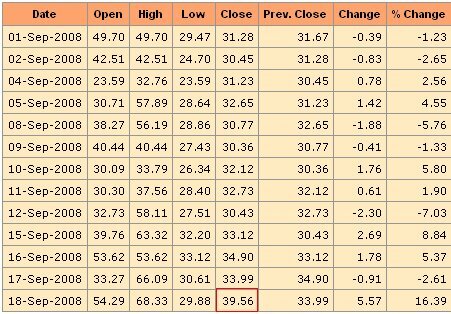 13 trading sessions from 31.28(1st Sep) to 39.56(18th sep). So Dont think that we would achive higher targets in near term. Nifty range is anywhere between 4200 and 3800 in shorterm. And the bottom testing may continue in short term.